A few years ago, I was traveling in Germany during the late spring. It was then that I discovered the German’s love of spargel (pronouced “shpar-gul”) There were signs on the side of the road advertising spargel for sale, billboards advertising spargel dinners. According to our tour guide, aka my older brother, there were even parties centered around eating it. Clearly it was a food whose seasonal arrival brought on a fury of consumption. Though we never attended one, my travel partner and I enjoyed declaring “SPARGEL PARTY! !” whenever we were in a particularly festive mood. 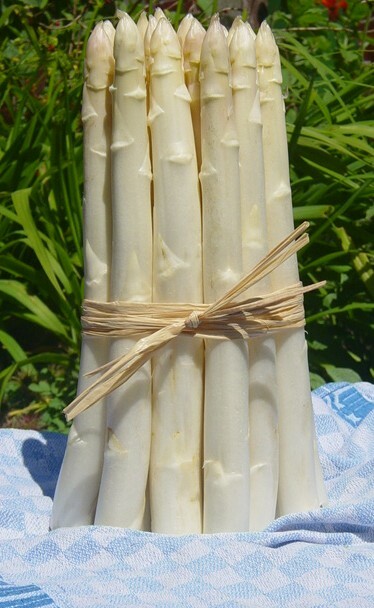 Someday I will attend one….someday…..
Spargel is white asparagus. It’s just like regular green asparagus, but grown underground. Its special growing method keeps the plant from photosynthesizing, so it stays both tender and white. Kind of like being indoors during a Midwestern winter. Many of the signs advertising tempting vegetable showed it plated with a yellowish sauce. I later found out spargel is typically served with hollandaise sauce. While shopping for beef and pate last weekend, I spotted white asparagus nestled in with the other green vegetables and snatched it up. Being of German roots and having a slew of ties to Germany, it seems fitting to give spargel its proper due: I would prepare hollandaise sauce. Also, out of respect, I will refer to it by its given name: spargel. SPARGEL PARTY!! You prep spargel just like asparagus: Rinse it off and remove the hard or woody ends of the stems. I roasted it in the oven, just tossed in a little olive oil and some salt. About 15 minutes in a 350° oven should do it. You want them to be a little firm still. Now for the sauce. Lots of recipes for hollandaise include scary descriptions of sauce gone awry. Words like “curdled”, “broken” or even “scrambled” were warnings of the delicate nature of preparing hollandaise. For this reason, I went with Alton Brown’s recipe from The Foodnetwork.com. He seems like the right guy to foolproof a tricky sauce like this. Since there were just two of us for dinner, I cut the recipe by 1/3. I didn’t think we needed 1 1/2 cups of hollandaise sauce. Start by heating an inch of water in a sauce pan and finding a bowl that will sit comfortably on top of the pan. The sauce is cooked over the steam from the water. Simmer the water and then turn to low. SLOW AND STEADY are going to be the key words to this recipe. I whisked my two egg yolks and water in the bowl, off the heat, for about a minute. Add the little bit of sugar and mix for another 30 seconds. Now…time for some steam heat. Place the bowl over the heated, slightly steaming water. Stretch your arm…and start gently stirring with your whisk. You don’t want the eggs to cook solid (ie. scramble) so make sure you keep them moving gently. I was whisking for a good 5 minutes before I noticed that I could pull the whisk through and see a clear line. Once I saw that happening, I lifted the bowl off the heat, set it on a hot pad, and added in one of the small pats of butter. I had already cut my butter into pats and then cut those into quarters. I basically had little cubes of butter. I added one and then whisked until it was fully melted before dropping in another one. After adding every 4 or so cubes of butter, I would pop the bowl back on top of the pot on the stove to get rewarmed. I would keep adding butter slowly while it was on the stove as well. 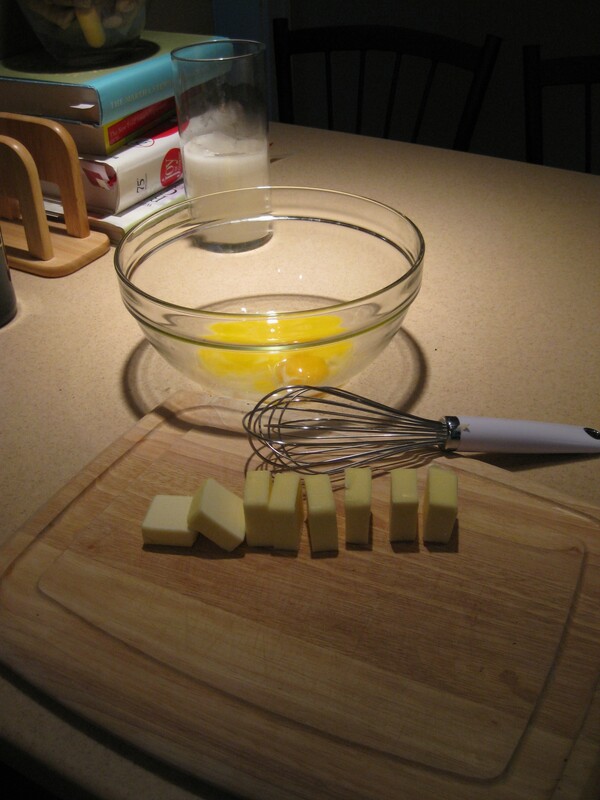 And yes….I was whisking the whole time. Eventually I added all the butter. Yes….a whole stick of butter had slowly melted in there. Our butter consumption has spiked in the last week. Slowly I added the lemon juice, a pinch of salt, and a dash of cayenne pepper while still whisking. After tasting, I a little more salt and a couple grinds of pepper to bring out the flavor just a bit. The sauce had NOT separated or gotten too thick or started cooking into scrambled eggs. Victory. SPARGEL PARTY!! A few more whisks and tastes…and, could it be?! Had I really just made hollandaise sauce!? I poured it into our milk frothing pitcher from the expresso maker. (shrugs) It was nearby and had a handle and a pour spout. The recipe made about a cup of sauce. Are you ready for it? Ready? 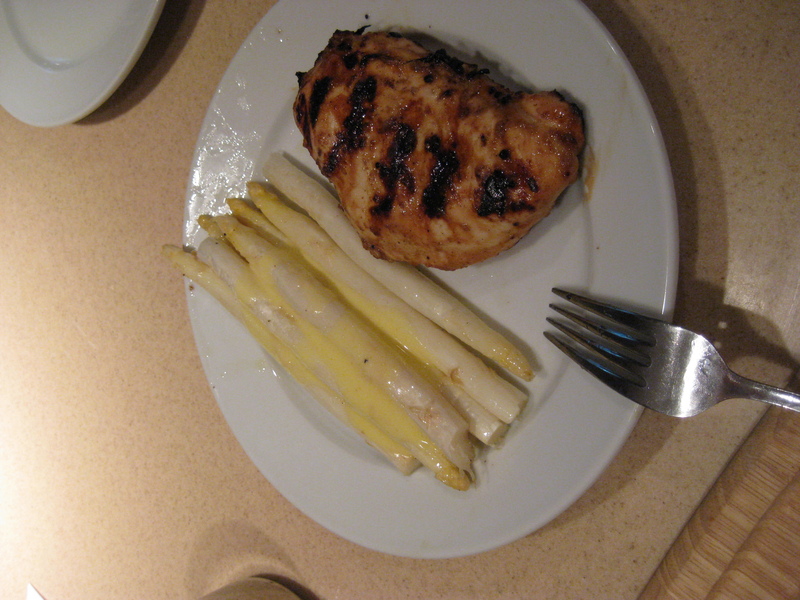 We had the spargel and hollandaise with grilled dijon chicken. And we tasted it…and it was like sunshine. Sunshine and butter. UNFORESEEN BONUS: My upper right arm is looking rather toned. Between cranking the food mill and whisking nonstop, who knew cooking could be such a workout?! Hollandaise is buttery, yes. But its different than butter. It doesn’t feel greasy in your mouth and it’s fresher somehow…it doesn’t feel as heavy as you’d think a stick of butter sauce would. I think the lemon cuts through the oily part of the butter and brings out the creaminess of an egg yolk. Either way, I was using the chicken to mop up every last drip on my plate. And I went back and poured more on my chicken. This entry was posted in 30 Before 30 and tagged asparagus, butter, cooking, food, Germany, hollandaise, spargel. Bookmark the permalink. It looks so wonderful. Those spargels are really healthy. This looks like a healthy delicious dinner. the Saprgel in myhouse gets chilled & used in a salad plate/chicken or ham, crusty bread-you get the picture. No sauces-why-well, 1’st it’s the Irish in me ,then there is the calorie count & lastly -but a biggie is the chloresterol amt. (a bummer to reckon with-esp. since butter is no longer on my slathering knife). Fresh asparagus is brought to me my neighbor Mike – he picks it locally but it is a short season. One of the perks of being his private gardener. Thanks for sharing your thoughts on electric skillet bbq pork steaks. Be careful not to burn out your blender by making your smoothie too thick. Store any extra servings in fridge for later in the day. Although not a classic “technical” gadget, it’s still extremely useful. Repeat this process for unlimited amounts of Gil to buy whatever you may need. the latest cheats for all of the current platforms. Before starting this smoothie recipe, remove pits from enough cherries to provide one cup of fruit.